Home > U.S. South > 1862 Preliminary Coast Chart No. 71 Florida Reefs from Newfound Harbor Key to Boca Grande Key. 1862 Preliminary Coast Chart No. 71 Florida Reefs from Newfound Harbor Key to Boca Grande Key. This is one of the finest maps of the Key West area of its era. 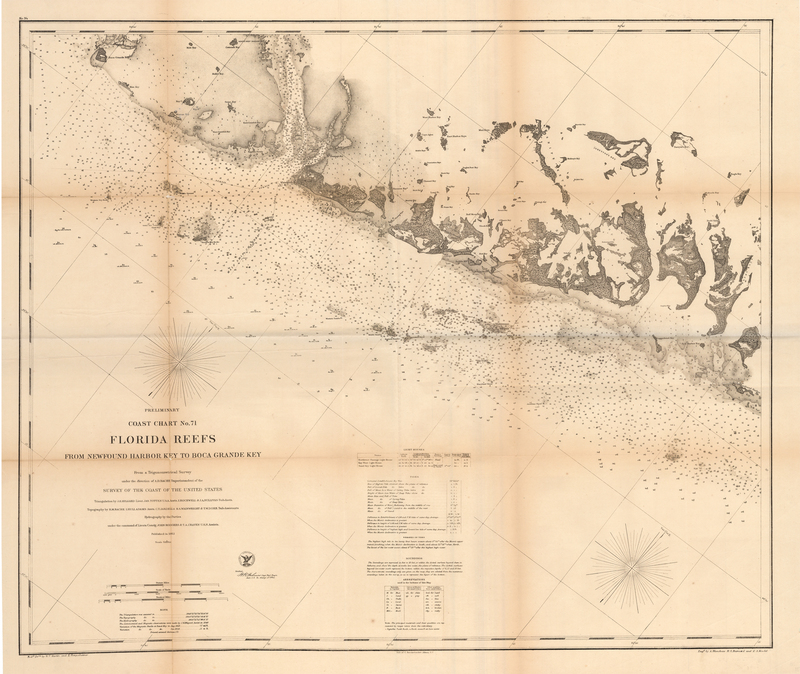 This black and white map of the Key West area was made for the United States Coast Survey. It provides depth readings and notes on important coastal characteristics of the area depicted. The names of harbors, rivers, islands, channels, shoals, capes, inlets and coastal towns are provided. Due to ongoing erosion and changes of coastal areas, maps such as this are of interest to anyone interested in local geography and history, and climate change. Such maps provide an opportunity to compare coastlines as they were at the time the maps were published to modern era shorelines which have been modified by storms, over-development, and rising sea waters. Condition: This map is in B+ condition. Toning around the folds is normal as the map was published folded. The chart includes the official Coast Survey Office Seal.